Megaquarium Online Slot is a 5 reel, 50 payline online slot game powered by RTG. Just as the name suggests, everything about this fun slot is MEGA! 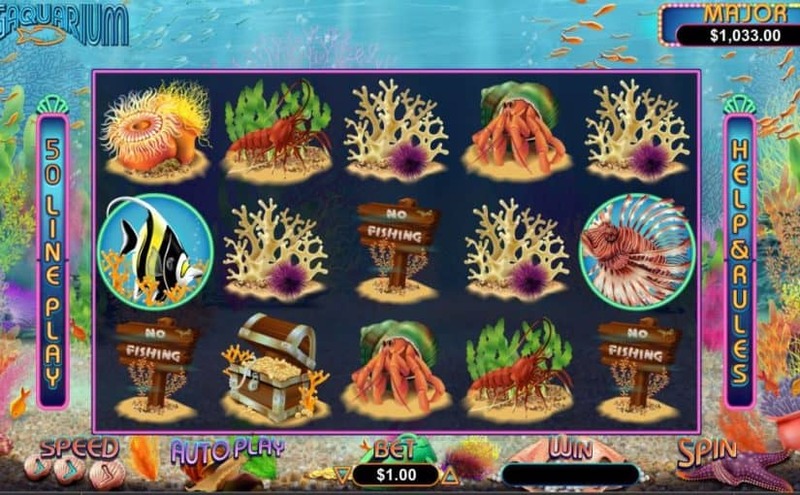 The Clown Fish is a doubling Wild on reels 2 and 4, and the “Free Games” symbol appearing on reels 1 and 5 awards 7 free games with prizes doubled. You’ll also have the chance to extend this feature by finding the ‘Bonus Games’ symbol on reels 1, 2 and 3 on your 7th free game, if you’re lucky enough for this to appear then 3 extra free games are awarded! The free games are never-ending in Megaquarium, at the final spin of each feature you’ll have the chance to extend your free games, with a possibility of 16 free games in total up for grabs!